Welcome to the flood of folks directed here by the generosity of Mary Colbert, over at Needle ‘n Thread! She blogged about Ensamplario Atlantio, and the visitor count here ballooned from about 70 per day to over 5,000. Given the large number of new folk, I thought I’d make a general re-introduction of myself and the site. My name is Kim Brody Salazar. I’ve been knocking around the web since it first crawled up from the primordial pre-Internet seas. Professionally, I’m a proposal manager specializing in engineering and high-tech. 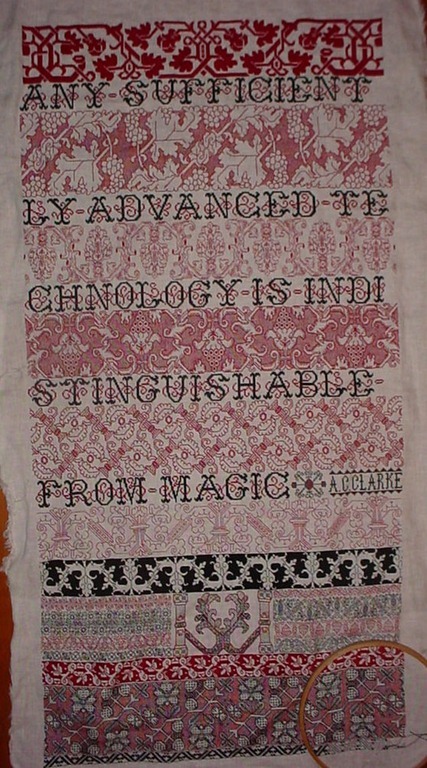 I escape from project pursuit deadlines into needlework, SF, good cooking, and halfhearted attempts at domesticity. Past passions include the Society for Creative Anachronism. I rarely attend SCA events these days, but is still home to many of my closest friends; and Aikido. I am abetted in these efforts by Elder and Younger Daughters, and by The Resident Male, the husband whose programming ingenuity was responsible for the plumbing behind wiseNeedle. As a family we are currently preparing for an extended sojourn in India, where he is now working. 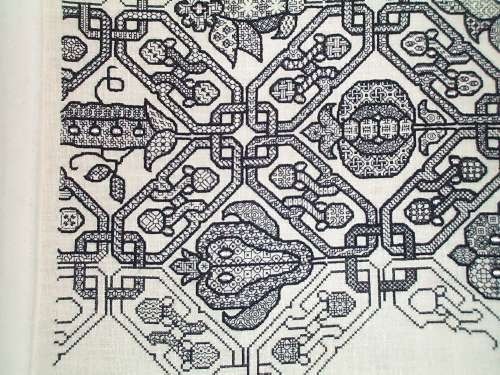 I’ve done many types of needlework, but my favorite stitching techniques remain the counted styles – especially from the great Modelbook Era (1520s-1650s). 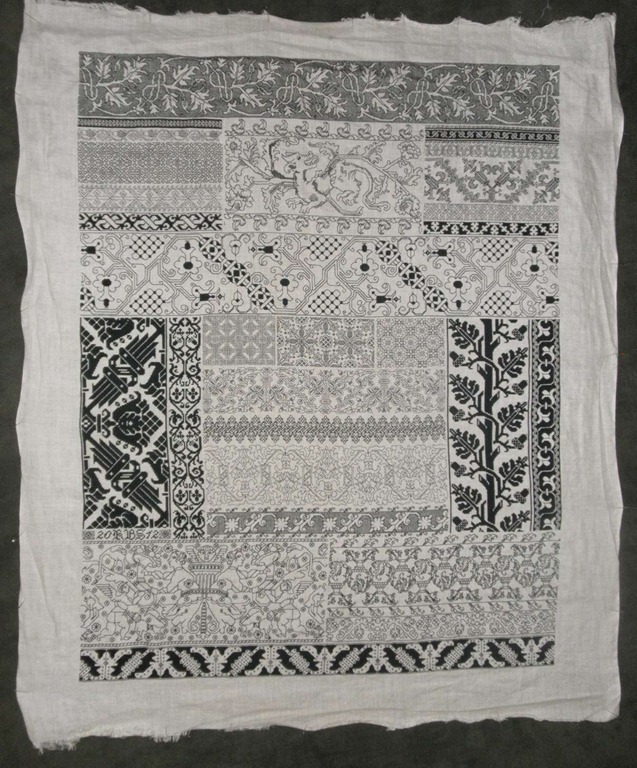 I adore blackwork in all its manifestations, and strapwork (the long strip patterns found on household and body linens). 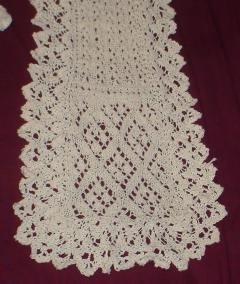 I’ve also played with several forms of needle lace and crewel, but in the days that pre-dated photo blogs. I am an avid though haphazard researcher, drafting up historical patterns from artifact and early book sources. I’ve put together several pamphlets of these designs. The most recent complete book was The New Carolingian Modelbook: Counted Designs from Before 1600. 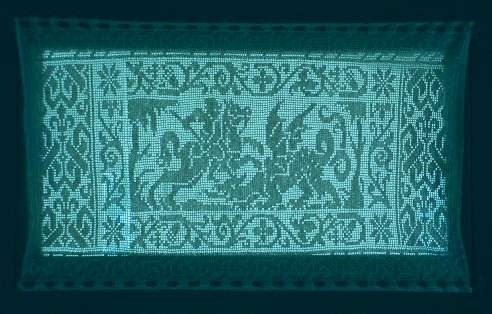 It was published for an SCA audience, but to my great surprise was discovered by the stitching community at large. I won’t go into the details, but TNCM is now out of print. I am working on a sequel, which I hope to have out soon via a print on demand or self-publication service. The Second Carolingian Modelbook: More Designs from Historical Sources will not duplicate the designs in my earlier book. Along the way, just for fun and to refine the methods I wanted to use for T2CM, I drafted up Ensamplario Atlantio. 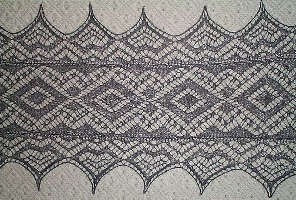 It’s a collection of filling designs for inhabited blackwork, along with quite a few that have stand-alone or strip application. I’ve released it for free as a series of PDFs, along with other free embroidery patterns, here. I also knit and crochet. I’ve done a bit of amateur design, and have had several of patterns published by Classic Elite, KnitNet, and Schaefer Yarns. I ran the wiseNeedle knitting info website (in various incarnations) from 1995 until just earlier this year. wiseNeedle featured an extensive needlework advice board, plus the glossary and patterns now here, along with a huge database of user-contributed non-sponsored yarn reviews. The yarn review database was salvaged by Nimblestix. Please feel free to consult to it and add to it over there. I also release knitting patterns for free here on String. 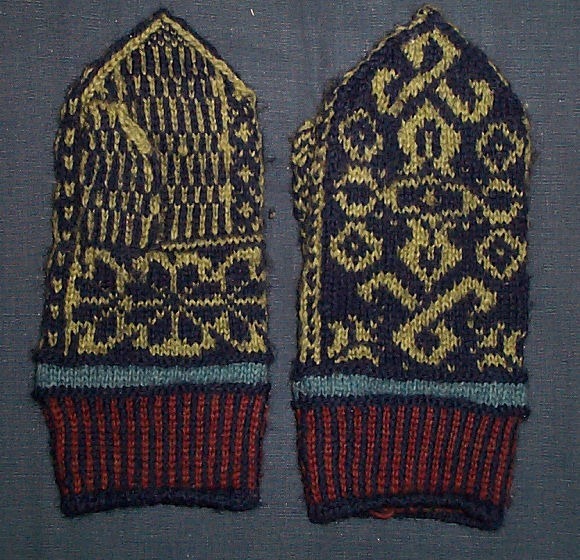 In terms of technique, I tend to favor texture knitting over stranded colorwork (although I like them both). 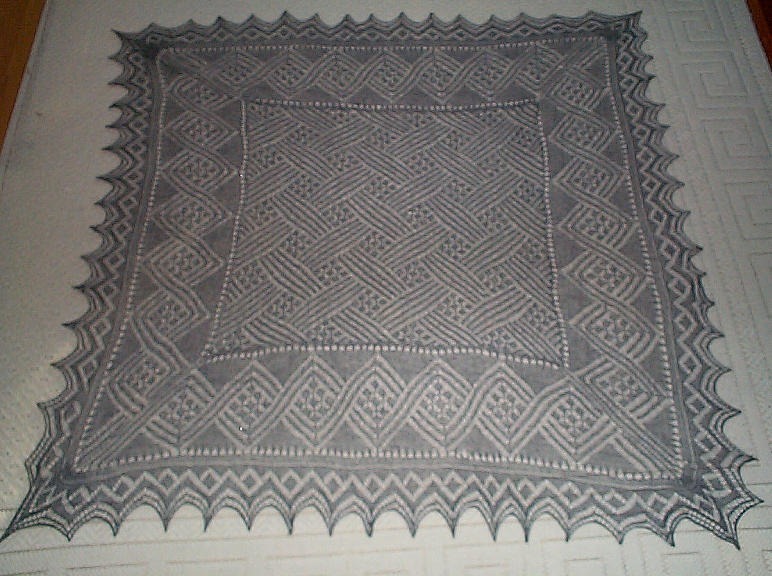 I especially like lace knitting, and mining the 16th century sources and late 19th/early 20th century knitting publications for designs elements, which I toss into the creative Cuisinart. That pretty much sums up my approach to all needle arts. I love the intricacy of many traditional styles, but I am not all that interested in producing stitch-literal reproductions. Instead I prefer to add to my design vocabulary to produce new works. Some of these I hope that – if they were to be TARDIS-transported back through time – would be accepted as just another piece in the target style, without being a dead-on copy of an extant artifact. Others are more playful, taking designs intended for one needlework medium and using it in another, or sneaking in incongruities just for fun. 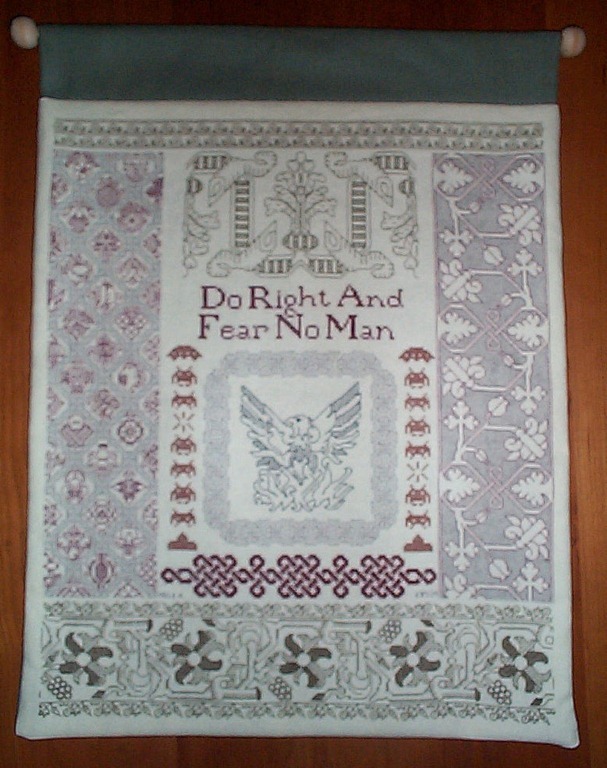 If you’re a needlework purist, I’m sure I’ll ruffle your feathers, and we’ll have lively debate. This is a good thing, because it will expand both our horizons. I also do not believe the common line that modern needleworkers have no skill or patience for large, intricate projects. I find the dumbed-down tone of most mass market stitching, crochet and knitting books to be patronizing and demeaning. If passion and interest are there, no skill curve is too steep to climb, and there’s no reason to set the bar of attainment artificially low. Steps up are good, but too many instructors top out on the lower plateaus, never expecting their students to advance beyond threshold skills, or offering up the higher levels as anything other than impossible high bars that we today can never achieve. Time can be found for whatever you want to do or whatever skill you want to perfect, even if (like me) it’s only 15 minutes here or there. 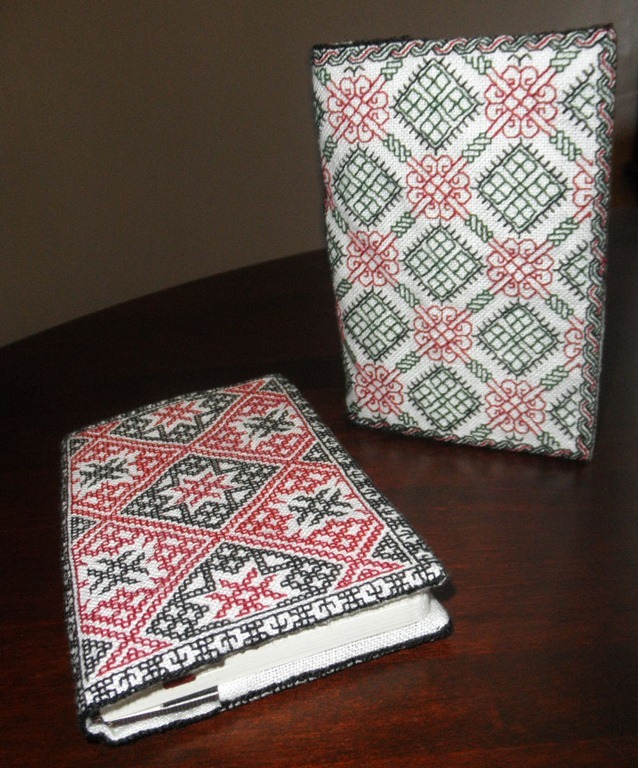 Needlework is like music or the martial arts – practice is required, there are no instant skills or guaranteed outcome. But like any training pursuit, the act of committing to the training hones the mind and the character, and teaches far more than the mechanics of the skill itself. I encourage everyone to set high goals for themselves. It’s the reaching that makes it worthwhile, whether or not the goal is grasped. I may never reach mine, but I’m sure having fun on the journey up. In any case – enough rambling. Welcome to my new readers and any long-lost friends! Elder Daughter here. She’s not lying about being able to do pretty much anything if you practice and approach it with a positive attitude. When I was just starting out, I would ask Mom, “How can I make this thing I want to make?” and she would tell me to cast on and not tell me how ‘difficult’ the project supposedly was going to be. Years later, here I am working on double knitting and making my own graphed patterns, which have been and will likely be featured again on String. New stitches and techniques I am always discovering. Great to meet you, Sue! You describe my sampler method – the blind leap off the cliff. Glad to know know a fellow Fearless is out there. Happy stitching! -k.
Hi Kim, been following you for some time and love your work. 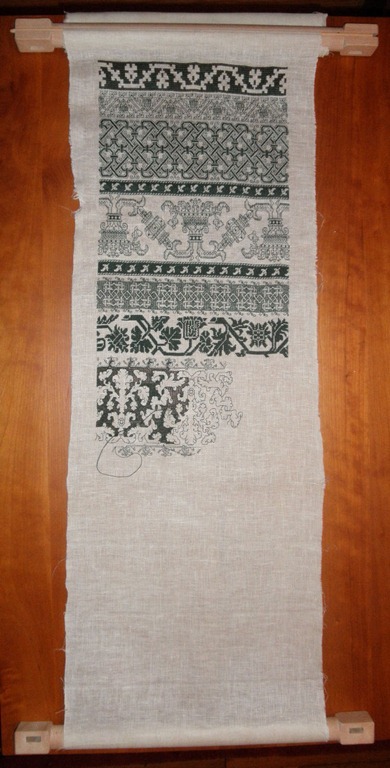 I’m still working on my sampler that will include a square or two from your Atlantio collection (at my Blackwork Lessons blog), but have gotten side tracked with basic design issues and questions for myself. Is there any chance you will be publishing a second edition of the Carolingian? Your “new” audience would, I’m sure, love to get a copy! I am going to try. The absconding thief of a publisher left a copyright and contract mess behind, but I still own the plate pages. Right now my priority is T2CM. TNCM re-issue will have to wait, but interest is duly noted and logged. Thanks! -K.